Phil Hogan, Commissioner for Agriculture and Rural Development, participated in a Citizens' Dialogue with 220 people in Glenties, County Donegal on the morning of Monday 23 July. The main themes of the debate were (1) the Future of Europe and the implications of Brexit for Ireland, and (2) EU-US relations, particularly in relation to trade. When asked whether he considered that we were now dealing with a fractured Europe, Commissioner Hogan said that the EU needed to get across the message that the citizens were the EU. Citizens needed to be aware of the fundamental values of the EU and the origins of the European project. Pat Cox, former President of the European Parliament, moderated the Dialogue. Patricia Callan, Director of the Alcohol Beverage Association of Ireland, was the second speaker. The event was held as part of the MacGill Summer School, a week of political and cultural debate. The event drew a large local and national audience. It was live-streamed and broadcast live on Highlands Radio which as the highest market share (62%) of any local radio station in Ireland. 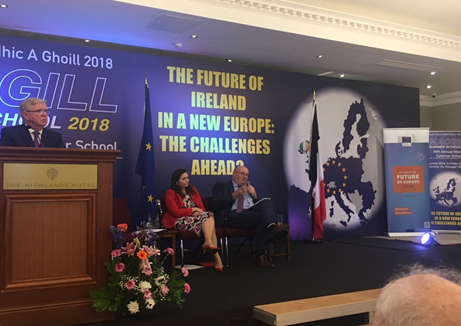 On EU-US relations, Commissioner Hogan outlined the challenges facing the EU, how the EU was working to address them and what further action may be needed. In his opening remarks Commissioner Hogan flagged that President Juncker was travelling to Washington on 24 July, and would try to appeal for reflection and reason, and a restoration of the values of transatlantic cooperation and solidarity that have underpinned the global world order for many decades. He would not be the first and probably not the last foreign leader to make such a case. On Brexit, Commissioner Hogan commented that Brexit was a "masterpiece of populism". He outlined the state of play of the negotiations. On the UK government’s White Paper, this was being studied by the EU's chief negotiator Michel Barnier. New rounds of talks had begun. But the landing zones were not very clear. Prime Minister May presented the White Paper as a blueprint for Britain’s future in the world and its relationship with the EU. However, in reality it is a negotiating mandate for the UK side of the Brexit process. It could not be regarded as a “take-it-or-leave-it” offer but rather a starting point in a process and its value would be judged on the clarity and the conditions it created for the discussions to advance. Pat Cox highlighted that whilst Brexit was important for Irish people, this perception of importance was not shard elsewhere in Europe.